We recently showed our appreciation to the teachers and staff of Wolf Lake Elementary. What a fun event and what a great day for a Berry Good Smoothie Day. I love smoothies. They’re a great way of getting a lot of healthy veggie/fruity nutrients in one sitting. Normally, I add a bunch of spinach to my smoothies, but on this particular day, we were out of spinach (The Wolf Lake Teachers Were Glad). It’s probably a good thing because it’s an acquired taste so we made vibrant, strawberry smoothies for the teachers. I usually drink my smoothie in a martini glass. Yes, it’s true there’s no alcohol in the glass, but it contributes to another goal of mine for the year, to live life like a queen. 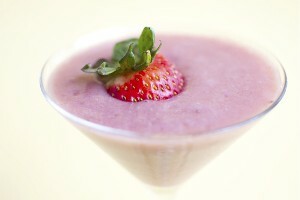 Strawberry Smoothies and martini glasses…something tells me it’s going to be a “berry” good day when I do that! Well as you can guess martini glasses we not used at the Wolf Lake Smoothie day but they still tasted great and were a great hit! Mrs. Grimando Wolf Lakes Principal started the event with the unexpected announcement that I had just saved her $1000 per year on her Florida Homeowners Insurance. That got me a big WOW! from all of the teachers. Thanks Mrs. Grimando for that endorsement and for your business. I’m now working with many of your teachers to help them too! We also had a drawing for a $25 gift card for the teachers at this event. That also went over pretty smooth. We are a Partner in Education with the Orange County School System and we love putting these types of events on at schools for our teachers. We do teacher appreciation breakfasts, lunches and after school dinners. So if your teachers need a “pick me up day” event or you really want my spinach smoothie recipe email me or give us a call.